Dogged questioning of Nishikawa in Diet Budget committee had become a distraction. The committee's vital work of approving of the next year's budget, due on March 31st, is already seriously off-schedule thanks to the double whammy of a December House of Representatives election and a February start for the Regular Diet Session. With the Nishikawa questioning it looked like it was going to run completely off the rails. Final stage negotiations for Trans Pacific Partnership looked similarly imperiled. The violations of campaign finance law in question were not huge -- one illegal campaign donation of 1 million yen (USD$8,400) and another of 3 million yen (USD$25,200). The violations were of a technical nature -- made before a legally mandated embargo of one year had expired -- and before Nishikawa became a member of the government. Nishikawa's office, which accepted the donations, had no practical way of knowing the donations violated the law. Nishikawa also had his office return the donations even while arguing he and his people had done nothing wrong. What he probably wanted to say was "Those who do not want to understand will never understand" or better yet "Those whose paychecks depend upon their not understanding will not understand." Such would have been perceived as rude -- and Nishikawa needs no more trouble. There were good, non-legal reasons why the prime minister had reason to accept, if not demand, Nishikawa's resignation. 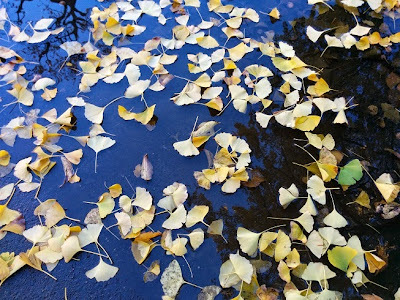 First was the principle of equality of the sexes, i.e., "What is good for the goose is good for the gander." Last year Obuchi Yuko and Matsushima Midori had to tender their unprecedented twin resignations for campaign violations, and quickly, for what in Matsushima's case were violations of comically minute scale. Sticking by Nishikawa, dragging out budget deliberations when Obuchi and Matsushima were so easily jettisoned for far less important legislation threatened to raise hackles within the LDP. 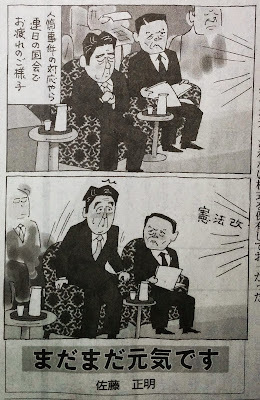 To be sure, Abe has had a rough time hanging on to his agriculture ministers. He had to replace three in his first, year-long stint in the premiership. The first of his ag ministers, Matsuoka Toshikatsu, indeed became the first cabinet minister to commit suicide while in office since soon-to-be-arrested-as-a-war-criminal Prince Konoe Fumimaro in 1945. The thought that opposition parties and public prosecutors would actually play along with such a LDP-serving concept is hard to swallow. However, one finds misogi references sprinkled throughout the literature. Nishikawa was already the target of opposition criticism in the fall extraordinary session. He should, logically, have been let off the hook by the 14 December 2014 House of Representatives election. However, Nishikawa did not actually win the public's approval in December. He lost the contest for his Tochigi district seat, albeit by the tiniest of margins (46.54% vs. 46.69% of the vote). He returned to the House of Representatives and the cabinet via the proportional "zombie candidate" route. So in a formal sense Nishikawa was not in line to claim retroactive immunity through a misogi of voter approbation. However, it would be unwise to put too much stock in misogi restraining the opposition from tying up the Abe government into knots over the rest of this session. The Tanigaki Sadakazu-led LDP's scorched earth tactics during the Kan and Noda administrations (where the LDP would not vote for legislation delivering on LDP campaign promises) dug a nearly bottomless well of ill-feeling in all of the opposition parties save perhaps the Japan Innovation Party. The opposition will be drawing on that resentment for years to come, harassing Abe cabinet members and Abe himself on the most piddling of deviations from absolute rectitude. The future -- especially a future where one of today's opposition parties takes power -- be damned. Later - The proposed decapitation of JA-Zenchu figures into the decision to accept Nishikawa's resignation. Since I think the reform of Japan Agriculture is bogus, or at least misrepresented, I am going to just let the whole matter slide. We can say now that Hakuho should have kept quiet, of course. He did win the rematch, convincingly. However, what if he had lost the rematch and the loss led to him missing his chance for a 33rd Basho? Denying Hakuho's control of the bout's momentum (Link - J) could have been a stunning blow to the history of the sport. Hakuho has good reason to worry at his age that a climb up into the dohyo might end in an injury cutting short his career, or that the victory of a young upstart (Chiyonofuji v. Takanohana, 1991, May Basho, Day 1: Video - J) might usher him off into inglorious retirement. Considering how much he has done restore excellence to the sport, it is hard to find fault in his sudden bark of frustration. Steve Miller of Asia News Weekly caught up with me the other day, allowing me to talk almost coherently about the Budget Speech, the supposed positive inflation/growth cycle and its discontents, constitutional reform and the 2016 House of Councillors election. For the streaming audio click the orange arrow. One can also download the podcast MP3 via the provided link. Mine is the exasperated voice at the beginning of the podcast, with the main body of the conversation starting at the 4:30 mark. Looking at Japan's perennially and perniciously weak consumer spending, the marriage rates of those not in permanent employment versus those who are, the decades-long reign of "public servant" at the top of "What I want my child to be when he/she grows up" rankings (for example, Bandai - J or Kuraray - J) the speed at the checkout stands at Ozeki supermarkets (I was wrong, Ozeki does employ part-timers -- but only high school students it seems) I am beginning to think that the fundamental divisions of economic factors of production into Land + Labor + Capital are unhelpful and possibly harmful. Indeed, in light of the rise of the glaring social downsides of the increasing fraction of non-permanent workers in the workforce, it may not be hyperbolic to say that looking to the economists of Anglo-Saxon economies for advice on reforms of the Japanese labor market is much like asking anarchists for advice on reform of the banking system. * Offer geographically restricted. Not available in some countries and territories. Check list for anyone watching for signs of "Oops, Not Everything Is Going According To Plan." Thirty-six utterances of the word "reform" in his third Budget Speech. Yow. Good luck with that, Abe-san. The Japanese government is supposedly at a heightened state of alert in the aftermath of the killing of hostage Goto Kenji and the threat made to Japan by ISIL. Apparently here in this blessed land (and never, ever has my catchphrase been more apt) the Most Important Man In The Government and possibly The Most Powerful Man In The World's Third Largest Economy can be met walking, accompanied only by a distinctly unarmed and unmuscular young male aide, toward his office in the Prime Minister's Residence using the underground corridor of Tameike Sanno Station at 7:20 in the morning, his identity and person protected by a down jacket (You want to know the color? That's classified) and a surgical mask. Chief Cabinet Secretary Suga, if you want me to believe that your government is taking the threats of terrorists seriously, you might want to consider pretending you take terrorist threats seriously. Like having at least ONE security officer walking with you, when you venture out in public. Or at perhaps wearing a hat. But thank you for proving to me, quite inadvertently and sweetly, that all the talk of Japan becoming a normal nation is just bombastic performance -- that you, of all persons, would find it expedient, during this time of heightened alert, to walk amongst us, like a modern day Mito Komon -- but a million times better than Mito Komon because you are the central government and you have no team of quasi-Ninja martial arts masters or a magical tobacco container to protect you. I was meandering without significant aim through the canyons of books in Maruzen's massive Tama Center store (if there are not 30,000 titles on the shelves I would be surprised) when I chanced upon a quiet, unostentatious display in the "NON-FICTION: WAR" section of the Young Readers area. Only it was not actually not a display. Someone had set books in an unusual way, face outward, with uneven spacing, almost in disarray. The titles, furthermore, did not all seem appropriate. Documenting War (Senso o shuzai suru) and Prayers for Rwanda (Ruwanda no inori) fit under the rubric "non-fiction: war" but Born in an Aids Village (Eizu no mura ni umarete) about a teen mother in Romania did not. Then my heart fell to the floor. Of course the books belonged together: they were all by Goto Kenji. 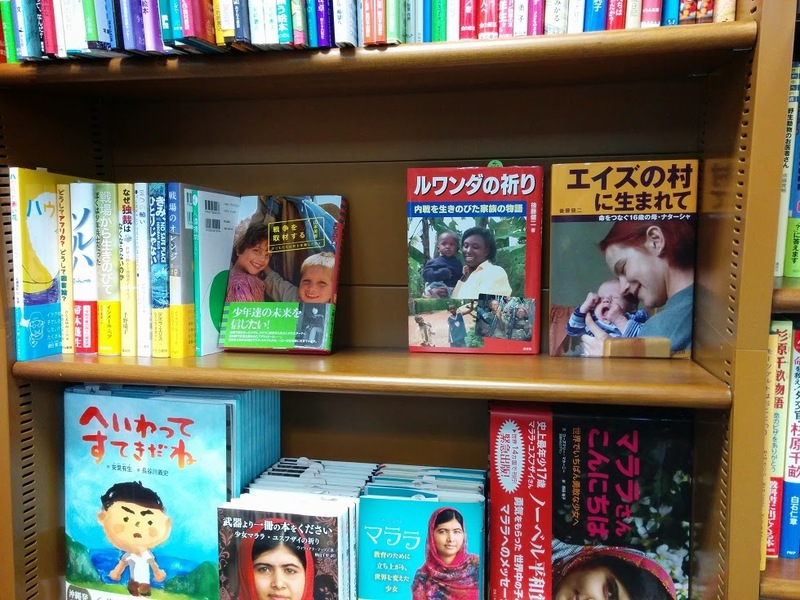 Whether intentional or not, the non-display display of Goto's books was right above the shelf of books by and about Malala Yousafzai. Ms. Yousafzai survived her peace-seeking confrontation with fanatics (who despite their vanity and poses are not servants of the Prophet. Indeed, they are only the scrapings-off of geopolitics). 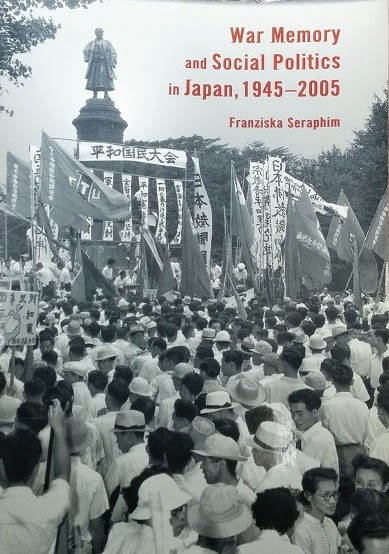 If you are looking, in this year of the 70th anniversary, for a book explaining the postwar struggle over memories of World War II -- and how this struggle affects contemporary Japanese politics, pick up a copy of Dr. Franziska Seraphim's War Memory and Social Politics in Japan, 1945-2005. The cover, which I reproduce below, is of that little remembered and today unimaginable September day when the Japan Communist Party took over the grounds of Yasukuni Shrine. Ignoring the absurd opening claim for now, what is one to make of the body of the story? 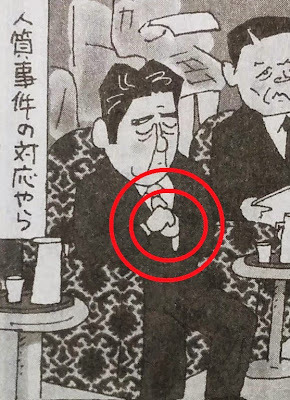 Remember that the Yomiuri Shimbun is the shameless snake-oil platform claiming that every single thing Abe Shinzo attempts is a majestic work of pure genius. OK, not all the time. But most of the time. However here, not even the Yomiuri Shimbun could pretend for more than a few seconds that there is a real reform story in the Abe reform of JA-Zenchu. Read that last paragraph again. When I read it I hear the echoes of the last lines of Animal Farm by George Orwell. As for the reform plan, all I can see it doing is taking away from JA-Zenchu its serious responsibility to oversee the accounts of the mid-level cooperatives, turning over the oversight function to accounting firms -- which, post-2008, we know to be a terrific, risk-free way of guaranteeing better governance at these bodies -- this in the industry that plays the truly minor role of growing and delivering the food we are supposed to eat. Kingston refers to this behavior as swinging for the fences. To be sure, Abe and Company do have incentives to propose way too much in the knowledge that in the back-and-forth of domestic politics ambitious proposals are whittled down to something the country's editorialists can disagree upon. However, Abe and Co. have a another important reason to overreach now: Abe is the Anti-Koizumi. Abe The Second Coming has been demonstrating a consistent and astonishing capacity to do the opposite. On any and every marquee policy proposal Abe and his colleagues drive voter support into the ground -- while leaving the Cabinet's popularity unchanged. The more Abe and Chief Cabinet Secretary Suga Yoshihide talk about a policy change, the lower the level of voter support, at least as measured by public opinion polls. One would think that out of pure luck Abe and Co. would chance upon some issue where the stance taken by the Abe government would increase in popularity over time. So Abe must seek the maximum at the outset, at the risk of appearing to be far ahead of the public mood, out of the practical realization that as he tries to explain what he wants to he will erode whatever confidence the public may have in the wisdom of what he is proposing. A corollary to the above is that Abe and his team members have a strong incentive to cut off debate at what seems ta midpoint and before the discussion has moved to a deeper level. If Abe is to get anything done, he has to cut his losses and move on -- at the outset. Which will one day make for a rather confusing and unsatisfying historical record. As for Kingston's conversation with Richard Samuels, Dr. Samuels (full disclosure: Dr. Samuels is a friend) gives his own paradigms short shrift. In addition to the advocates of rapid expansion of Japan's security program and the advocates of a retreat to first principles of Japanese post-1945 security policy mentioned in the Kingston essay, a full Samuels treatment would fine a third group arguing that even though the attempts to negotiate a hostage release ended up in failure, such negotiations have ended up in failure for every national government other than that of Turkey -- and one shudders to think what the Turks gave up to secure their hostages. Japan, according to this view, did no worse or better than anyone else. Japan is therefor not on the wrong path in terms of its security policy development. The government and the people should not panic. Samuels explores this tripartite division of responses to threat and catastrophe in his most recent book 3.11 Disaster and Change in Japan. Amaterasu willing, 3.11 could see the light of day in a Japanese language edition sometime soon. The key takeaway -- and Samuels hammers away at this in 3.11 and in his public appearances -- is that almost no one comes away from these experiences with his/her assumptions shaken. Those who wanted to accelerate policy change and/or switch Japan's policy direction will find the government's inability to save Yukawa and Goto demonstrates the rightness of their views. Those who advocated steady-as-we-go, progressive, "normalizing" policies will downplay the failure and declare the maintenance of a cool, cerebral demeanor paramount. Those who have disliked the expansion and transformation of Japan's security behavior, advocating either a slowdown or more often a reversal of the processes of the last three decades, will see Yukawa's and Goto's deaths as justifying their caution and skepticism. Some readers may find Kingston's tone and vocabulary overblown. Consider them responses to the extraordinary gall displayed by certain members of the Japanese foreign policy commentariat who seen it appropriate to condemn/decry the sharp criticism of the Abe government. The calls for national unity and support of the Abe government made by these person who shall remain nameless would fall on more receptive ears if residents of this blessed land could forget the vicious, opportunistic and avaricious attacks showered upon the Kan government in the days immediately following the triple disaster of 3.11, even as the country was reeling from the disruption caused by the earthquake, tsunami and an unfolding massive nuclear accident. No solidarity then, friends, means no solidarity now -- and no rhetorical restraint now either. If the Spirit, Who is Life, exacted an eye for an eye, or a tooth for a tooth, this world would indeed be peopled with the blind and the toothless. One of the correspondents of Voice of America called me up yesterday and asked me about the deaths of Yukawa Haruna and Goto Kenji. VoA was then kind enough to include bits of the conversation in a report (Link). To deaths of Yukawa and Goto, we must add three more. As for the expression of an admixture of emotions from the PM (Link-J and Link-E) I confess my own reaction is one of exhaustion. As for the affiliation mentioned in the report, it is, in the words of the Nixon White House, no longer operative. I am an adjunct fellow of the Institute of Contemporary Asian Studies at Temple University Japan and an advisor at Langley Esquire. Miyake-san (whom I like a lot, for a good many reasons) has gone overboard in his utterances, carried away by rhetoric and emotion...just like the man who is ever seeking Miyake-san's advice, Prime Minister Abe Shinzo (no exaggeration: Miyake-san is the most important of Abe's private sector security advisors). The PM has been flying off the handle a lot of late, with Chief Cabinet Secretary being forced to step in and reel back expectations. Many thanks to Elaine Kurtenbach for sending me her questions. The folks behind the Number 1 Shimbun, the house publication of the Foreign Correspondents' Club of Japan, offered to publish some of my musings about last month's Democratic Party of Japan leadership election.